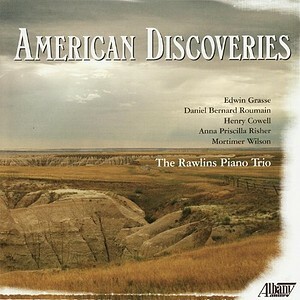 American Discoveries showcases the Rawlins Piano Trio's focus on American trios from the 19th and early 20th century. These works by Edwin Grasse, Anna Priscilla Risher and Mortimer Wilson reflect romantic sentiment. The disc also includes works by American Experimentalist, Henry Cowell and Daniel Bernard Roumain (DBR), the trio's first commissioned composer.